I’ve been buying whole pork loins lately: they come with a lovely pork loin for about two thirds and sirloin for the last third. The loin is very nice but the sirloin on these pieces is jagged and just isn’t pretty, so I cut it off. 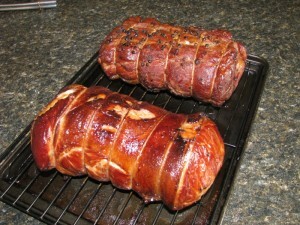 I find this cut works wonderfully for two applications: my bacon recipe and a slow roast smoked on my big green egg. The front roast is my smoked slow roasted sirloin and in the rear is the cured and smoked bacon sirloin. The sirloin is a big jagged as it had a bone removed so it’s best prepared by tying it together with butcher’s twine every 1.5″ or so as you can see in the above picture. It holds it’s shape nicely for prep and once cooked and rested the twine can be cut off. I like to prepare the sirloin roast by tying it and then covering it in a dry rub: I’m partial to Steven Raichlen’s all purpose rub from his book How To Grill but use whatever you like. Once it’s sat for at least twenty four hours in the dry rub it’s ready for the barbeque. I like to hot smoke it at 250 degrees F until it reaches an internal temperature of 160 degrees F.
As you can see it had a nice smoke ring and a wonderful fat cap that kept this roast moist and succulent. Man oh man was that good eats. 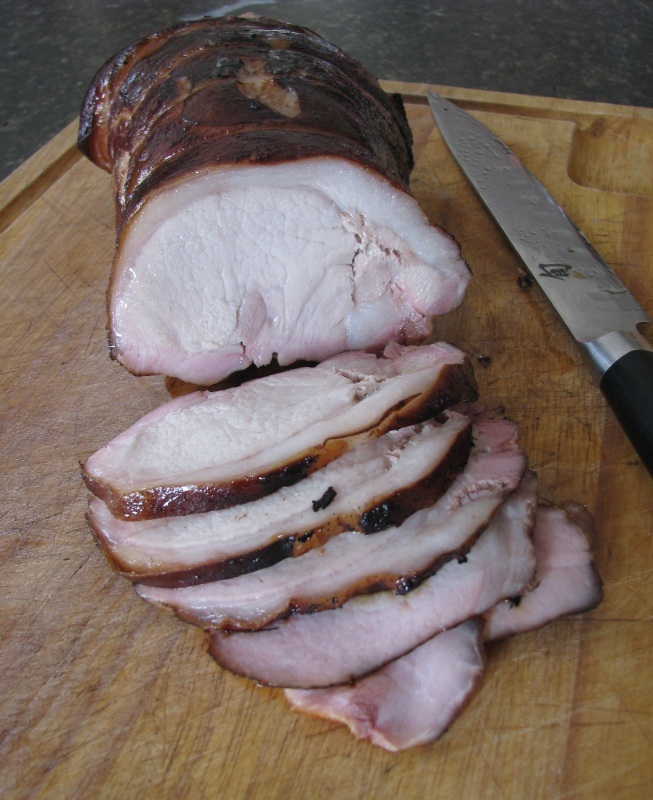 Pork sirloin is a wonderfully versatile cut that can be had inexpensively.